According to the MMGY Global 2015 Portrait of American Travelers®, an estimated 4.2 million American households are interested in visiting a destination in the Middle East during the next two years. Who are these potential travelers? Where does Jordan fall in the hierarchy of destinations they are considering? How much do they know about what Jordan has to offer? How can Jordan appeal to them? And what do these travelers want to experience? 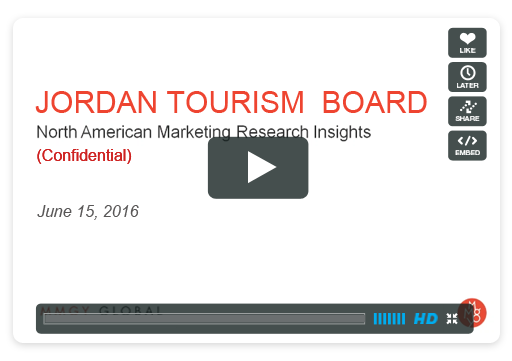 The Jordan Tourism Board North America (JTBNA) commissioned an in-depth research study to yield answers to these questions with both leisure travelers and travel trade professionals across the U.S. and Canada. The research, completed by MMGY Global, reveals that although Jordan lacks awareness, once travelers interested in the Middle East learn more about the destination the majority of them are interested in vacationing there. Register to watch the webinar in which MMGY Global's Market Insights team reveal the results of the study along with their implications for future marketing, advertising and sales promotional strategies. Please take a moment to fill out our annual North American trade survey! This gives us much needed insight into a market that you know best and will help us do a better job in driving more business to you in the coming year. All information will be considered confidential and will be used solely for collective statistical purposes.